Two letter-size file cubes slide easily on powder coat (fpr durability) steel channels. Top shelf offers additional storage. Four casters (two locking) for mobility. Fits under most work surfaces for easy storage. Collapsible cubes make assembly quick and easy. Tubular steel mesh design. 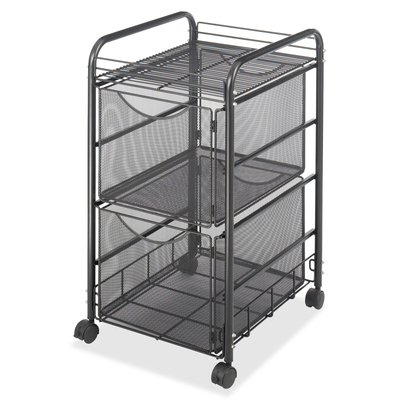 Durable, contemporary tubular steel mesh provides practical organization. Convenient letter-size file cubes slide easily on powder coat (for durability) steel channels. Top shelf offers additional storage. Four casters (two locking) for mobility. Fits neatly under most work surfaces for easy storage. Collapsible cubes make assembly a quick and easy.